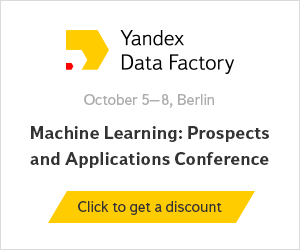 Join data scientists from Badoo, Deutsche Telekom, GfK, TripAdvisor, AIG and other leading innovators who will gather to discuss the challenges they face in machine learning and the future of and big data at a business session organized by Yandex Data Factory as part of the international scientific conference 'Machine Learning: Prospects and Applications'. Fully interactive and hands-on, this business session eschews the trendy topics and buzzwords, aiming instead at exploring the essence of the changes that new technologies bring to the real world and the lives of both the ordinary people and big enterprises. Register here. Sharks, Landsharks, Geoplotting, and KDTrees! "This is the best general-readership book on applied statistics that I've read. Short review: if you're interested in science, economics, or prediction: read it. It's full of interesting cases, builds intuition, and is a readable example of Bayesian thinking."